So, I finally got around to sorting all the junk that was stored in this room whilst I was renovating my bathroom and bedroom. Bringing the desk upstairs on my own was a very near huge failure. I got stuck mid way, literally pinned to the stairs under the desk… it isn’t too heavy but it was such a tight fit. I also massively scraped the banister and wall and the drawer fell out from mid way up the incredibly steep stairs, bouncing three times…. very loudly. I’m sure I gave the neighbours an almighty shock. I need to fix up the walls and banister, but the drawer was more or less unscathed. I was going to sand the desk and paint parts of it, but it’ll do as it is for now. It still looks pretty good. Besides, I can buy my A3 laser printer now and get trading. A couple of weeks ago I got rid of the last polystyrene tiles… they were on the landing. 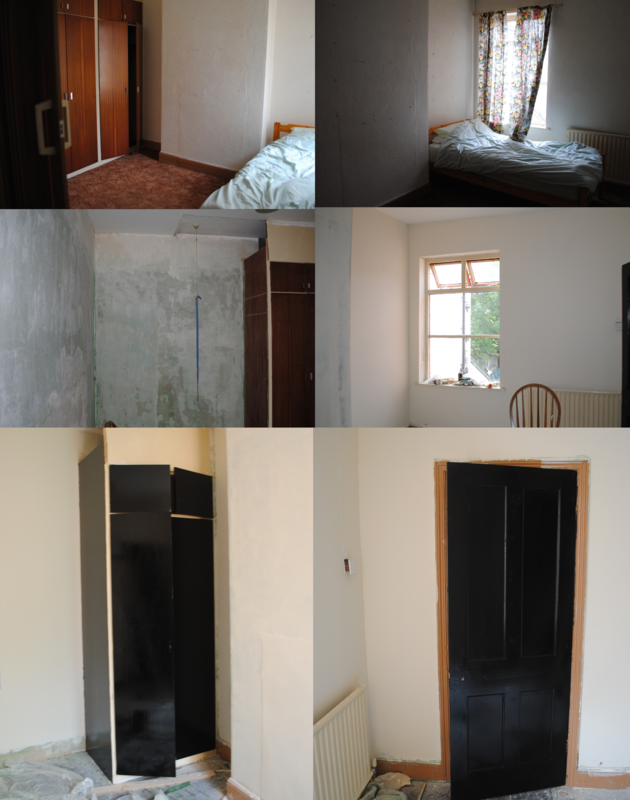 I’ve also stripped the last of the wallpaper in the house – the stairs, landing and master bedroom. 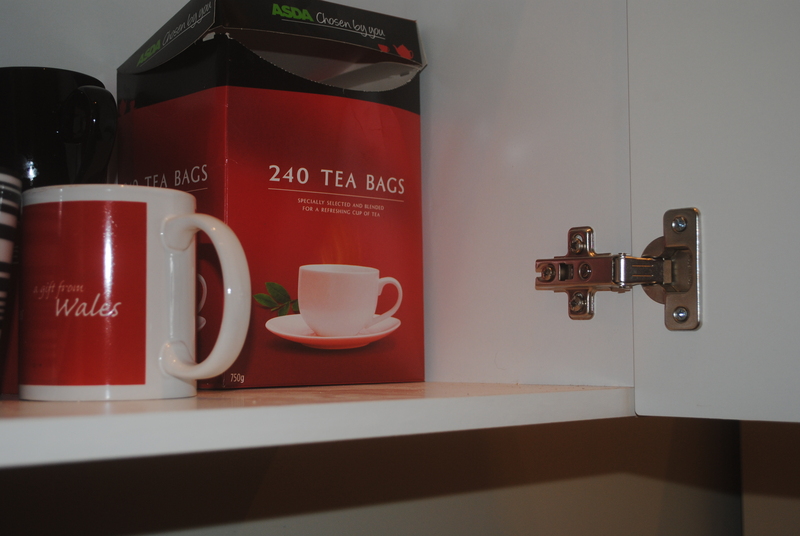 I’ve mostly prepped the walls now. Just need to sand down where I’ve re-filled and should be ready for painting the top coat colour. 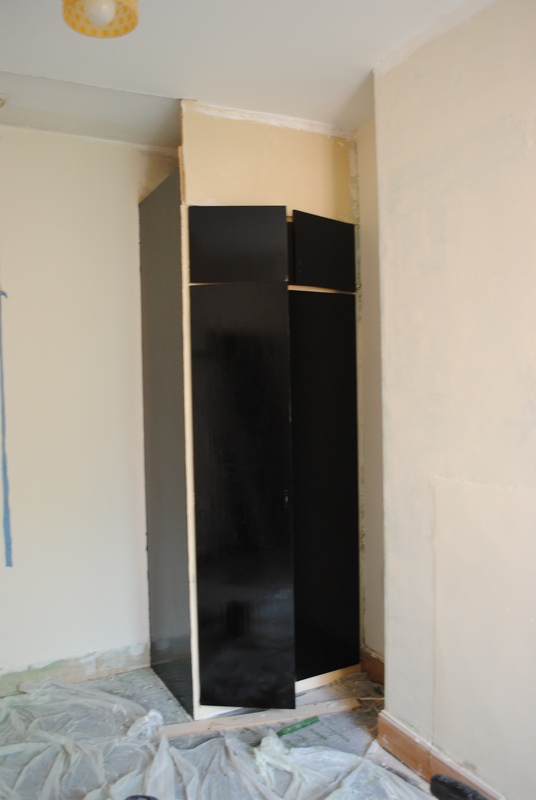 But no point painting until the plastering is done. I’ve patched up the massive 3.2m x .65m gap in the ceiling where the wardrobes used to be. I also chased in a misc. live elec cable and rendered over. 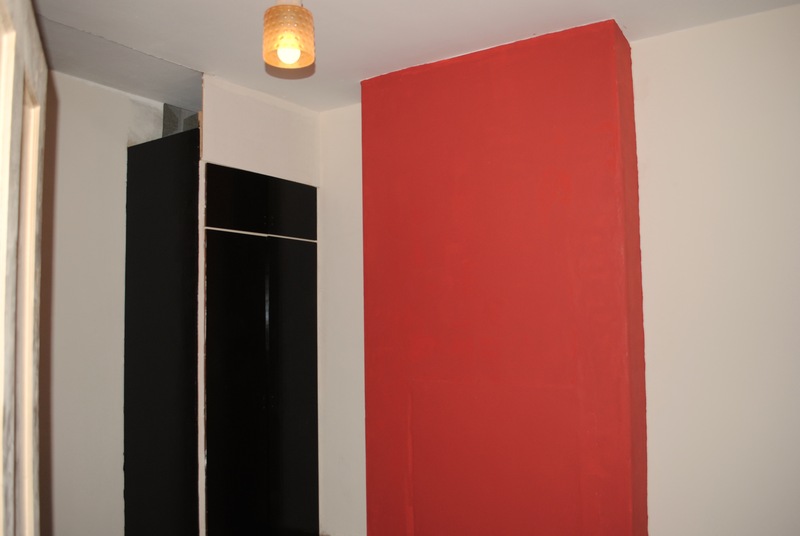 The ceiling and wall is also ready for skimming. The plasterer said I needed to get the wooden edging strips off the chimney, because otherwise the new plaster would crack. Took a while to get the strips off, they didn’t want to budge. And loads of plaster and render came away in the process. Doh. You can see the holes in the chimney where I was seeing if there was a fireplace hiding behind it, but I didn’t find one. Now just to get the last bits of wallpaper down and patch up the rendering before I can get the plasterer in. I also viewed a house down my road, just to know the market more and see what I can aim to sell mine for. The asking price was £130k. 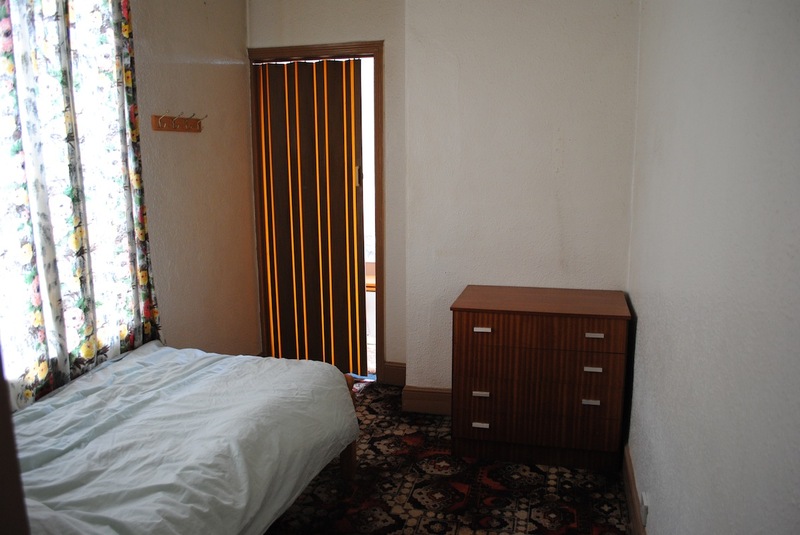 Bigger bedrooms and the third room is a proper room and a decent size. 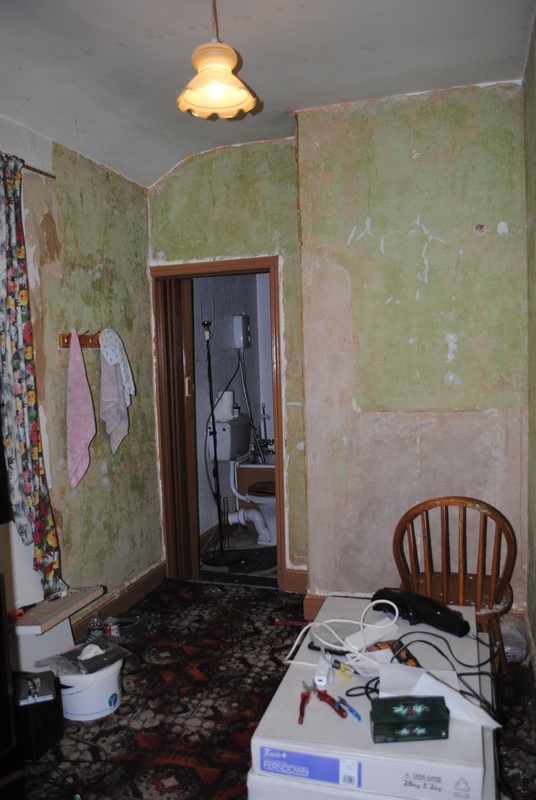 But shabby as hell, with a skanky bathroom, dodgy pipework for the radiators running across bedroom walls, awful cladding in the small kitchen and very badly finished throughout. If that sells for anywhere close to asking, I’ll be very happy… as it means mine will be worth more than I thought. I can hardly move, partly due to priming and painting, but mostly because I bought a belt sander yesterday and have started sanding the lounge floor. It’s coming up really well, it just takes a hell of a lot of body power, crawling around on the floor, guiding the machine as it tries to run away from you. 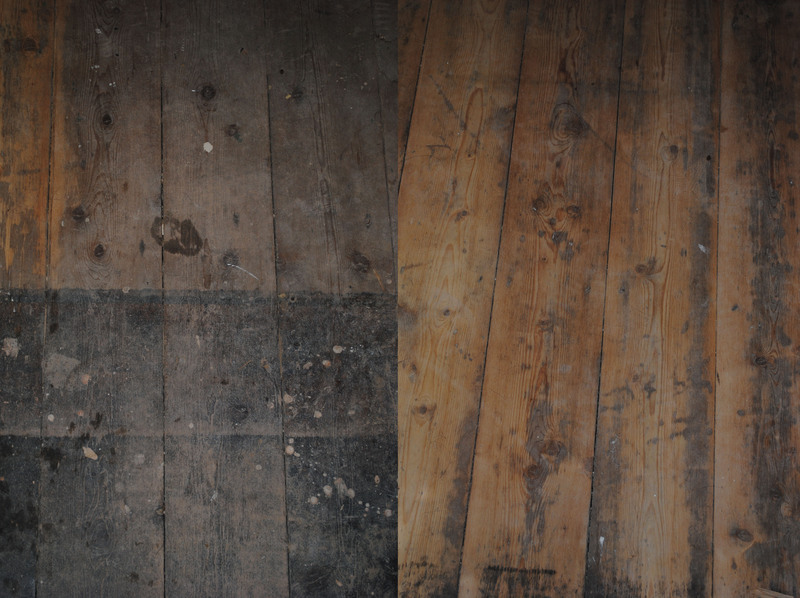 The floorboards are coming up well, these need going over with a coarse paper again and then doing several more grades of paper. But I’m very impressed with the little belt sander I got in Lidl for £25. 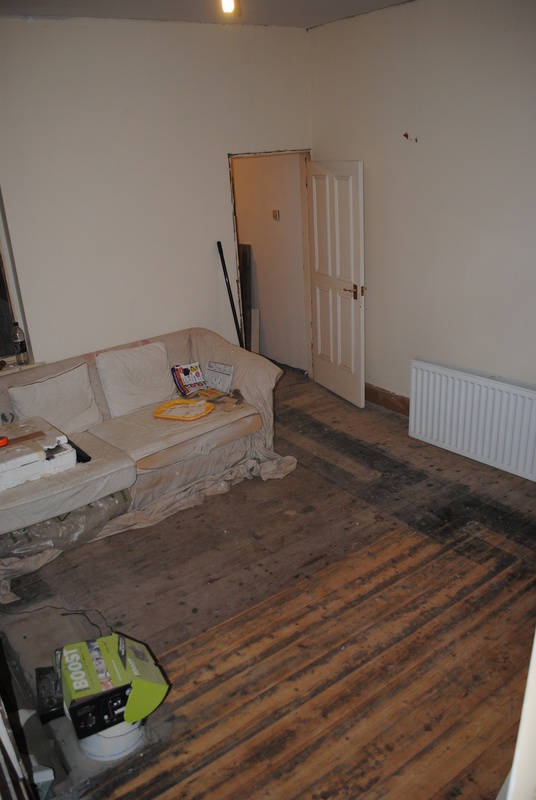 Now all the builders stuff has gone and I’ve made a start on the floor, it’s looking MUCH more like a lounge. I also bought 19sqm of kitchen floor tiles today. I’ll start to fit them in a week or 2. 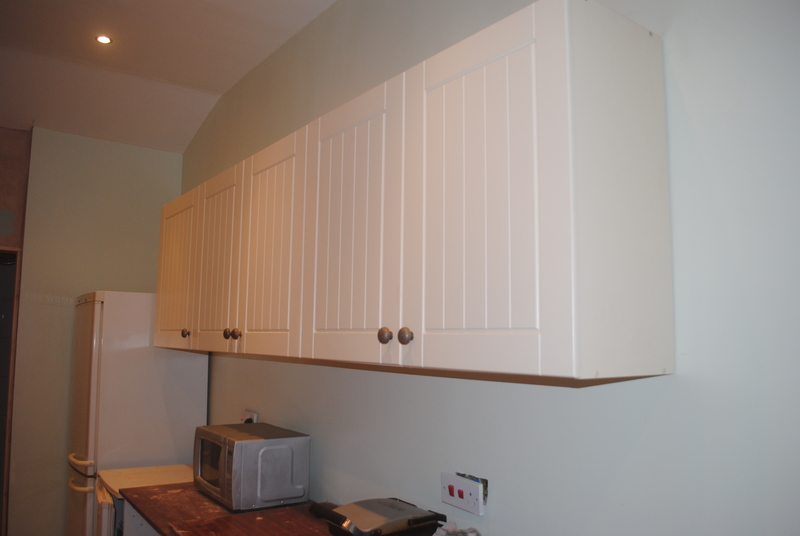 My solid beech worktops are arriving on Friday and I plan to get the kitchen fully painted before then. The bedroom looks much more like.. well a bedroom now that it has a carpet in there. It’s the same carpet as the landing, much better than the horrible carpet that was originally in there. It just needs the door changing (and windows – next yr) and it’s done. There was a change of order to the building works. Last weekend the non load bearing wall was taken down and the lobby and shower room floor was dug out. Toilet removed. Most of my back garden is piled high with rubble now. 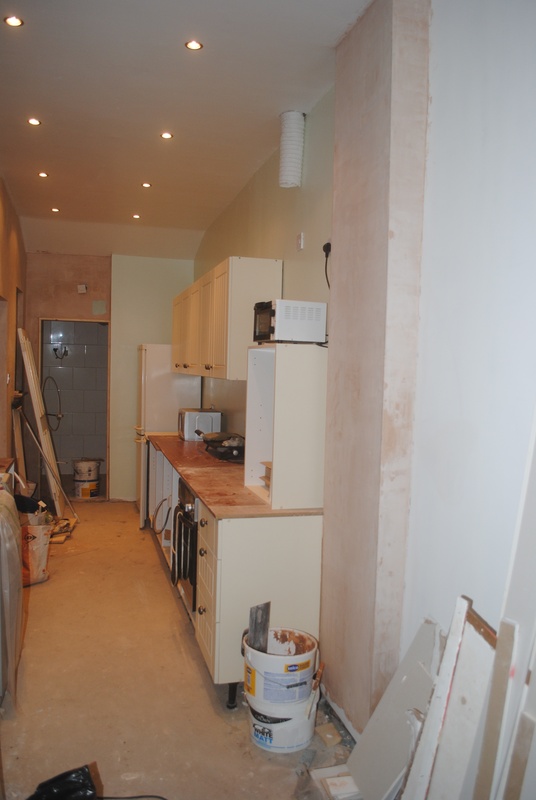 The plaster was also removed from all of the shower room and lobby and 2/3rds of the kitchen. 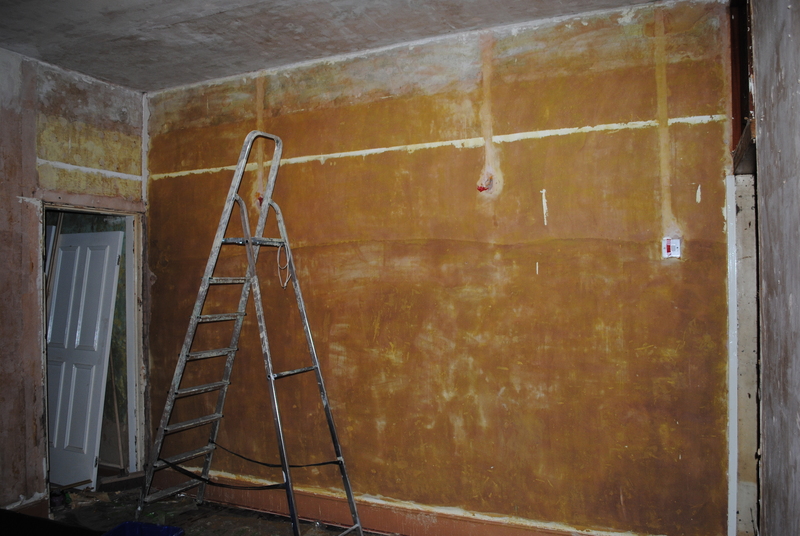 Wed – my builder removed plaster up to 1m on the party wall, for damp proofing. He also set up the electric shower upstairs as a temporary measure, but my pressure is too low, it wasn’t getting water quick enough to get hot. Moving the header tank to the loft will help, but I may still need a pump. Damn. 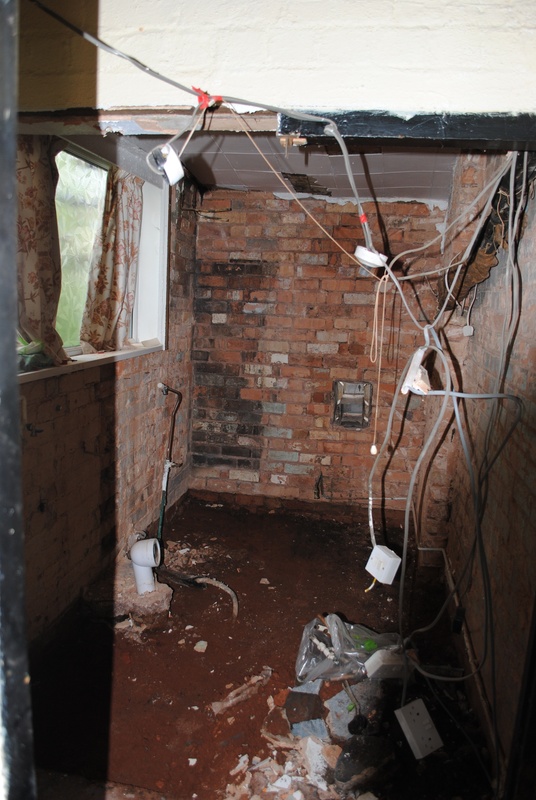 Thurs night – builder’s removing plaster up to 1m in two sections of the lounge, for damp proofing. (10 min job). 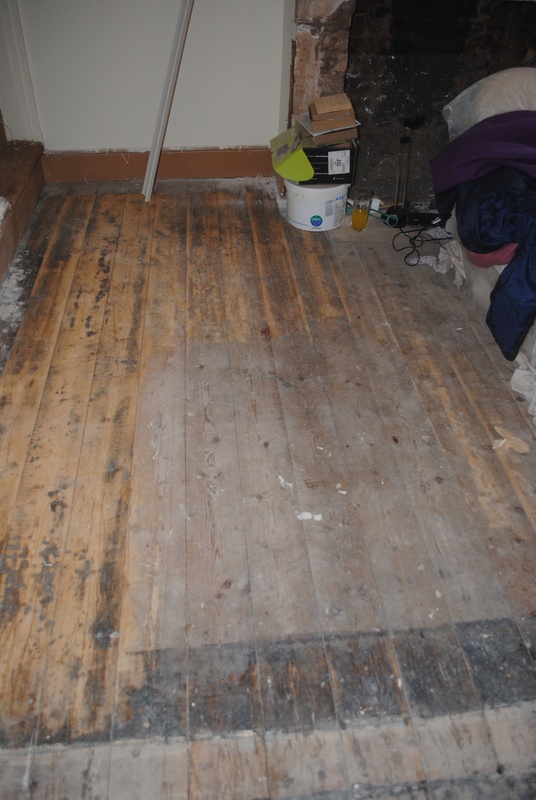 Sat & Sun – builder will be digging out the rest of the floor. The RSJ will go in and with a bit of luck the roof should be going on. Skip is booked to be delivered and later collected on Sat. It’ll then be time for the stud wall going in for the shower room, which is now going to be a swanky wet room. And as the builder will tank the floor after he’s laid the new floor, the price will be approx the same. I was going to tile the floor anyway. Save £160 on shower tray and enclosure, spend £80 on wall tiles and a few hours tiling labour costs. Sounds good to me. The only bad thing is that the builder recommended fitting the new windows to the kitchen now, as the frames are wet and rotten and there are no lintels above the windows. I was going to wait until next year to do these windows to give me time to save up some more money. But he’s said I should do them now, even if it means not paying him right away. I need to choose an exterior door too. I’ve ceized work on the lounge for now (filling, priming). I’m waiting until the damp work has been done and the wall replastered. I’ve started work on Bedroom 3 instead. Mainly so I can do that room and then have somewhere to set up my drumkit!! I’ve stripped the paper off Bedroom 3 and the plaster is ok, except for around the windows, where new plaster has been put on badly. 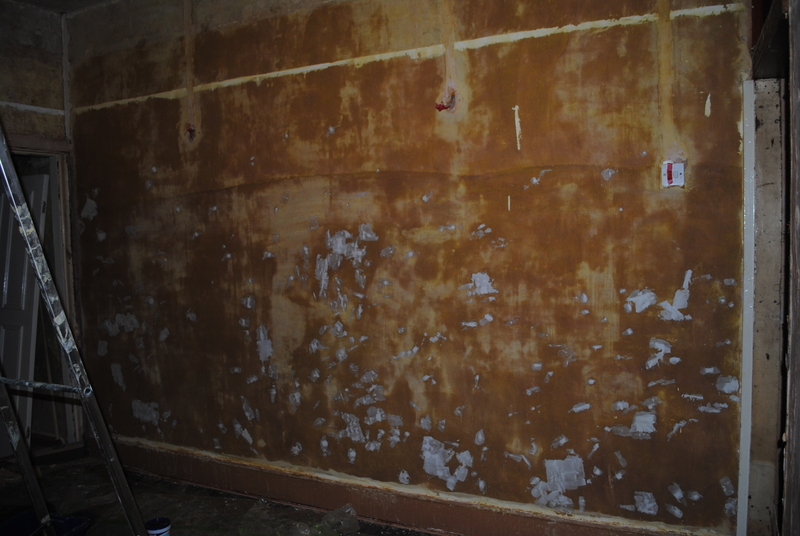 I thought I’d need to have this wall re-skimmed, but my builders given me some good advice and I’ll use some joining compound and joining tape and it will be sorted. By the end of the weekend I plan on having all but the window wall nice and smooth, ready for painting. 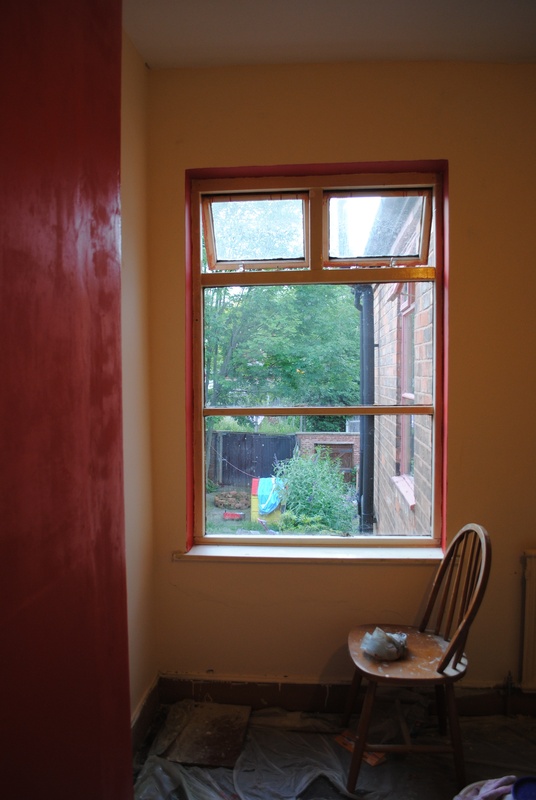 Today I’ve painted 2 coats on the window surround, 1 coat on the chimney breast in bedroom one. 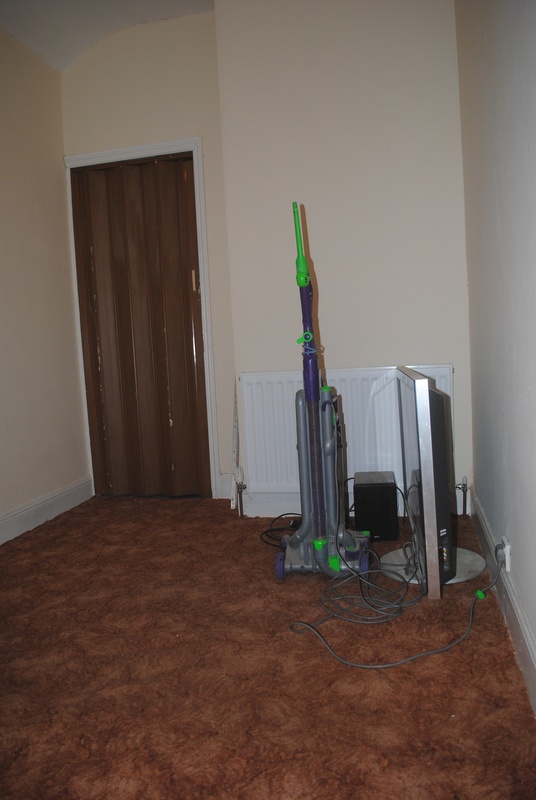 I’ve also steam cleaned the lounge carpet, ready to be laid into bedroom 2. I’ve also washed 1/3 of the lounge and finished round 1 of filling. Victorian houses had the walls totally covered, so there were an awful lot of rawl plugs to remove and holes to fill, plus other grazed areas etc. Not bad, considering I’ve only had evenings and weekends to work on the house and some evenings I’ve worked late and had other commitments. Well bedroom 2 had my attention this week and it’s almost finished. It’s all painted apart from the chimney and window surround, these will be done Tues. Then it’s time to give the lounge carpet a thorough steam clean and lay this in the bedroom. There’s now one week before I need to be fully moved in. I have a couple of days booked off work. As well as finishing off bedroom 2 I’ll wash the living room walls this week too. Then it’s waiting for the rising damp to be sorted before painting the walls. I’m also seriously thinking about skimming the hall walls. 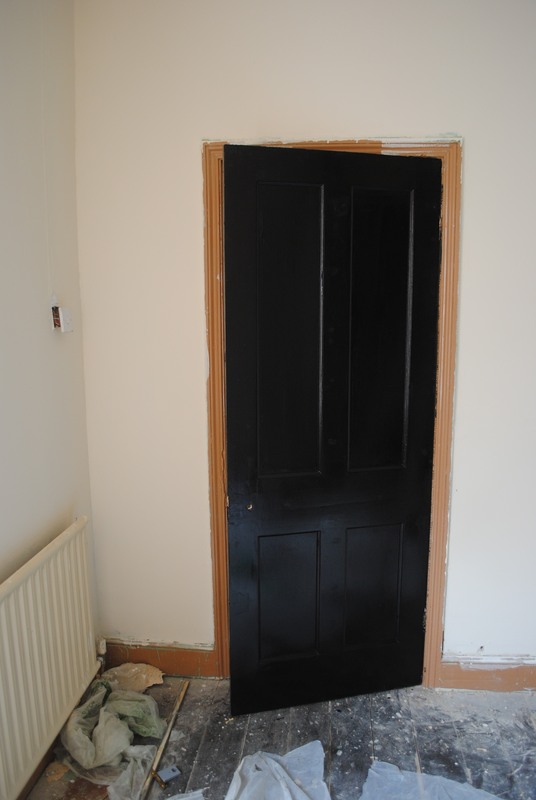 I spent hours washing the walls, but there are some four parts of the wall where two doors used to be that will never look good unless skimmed and the walls are pretty bad generally… so realistically it makes sense re-skimming. So stopped work on the hall for now.